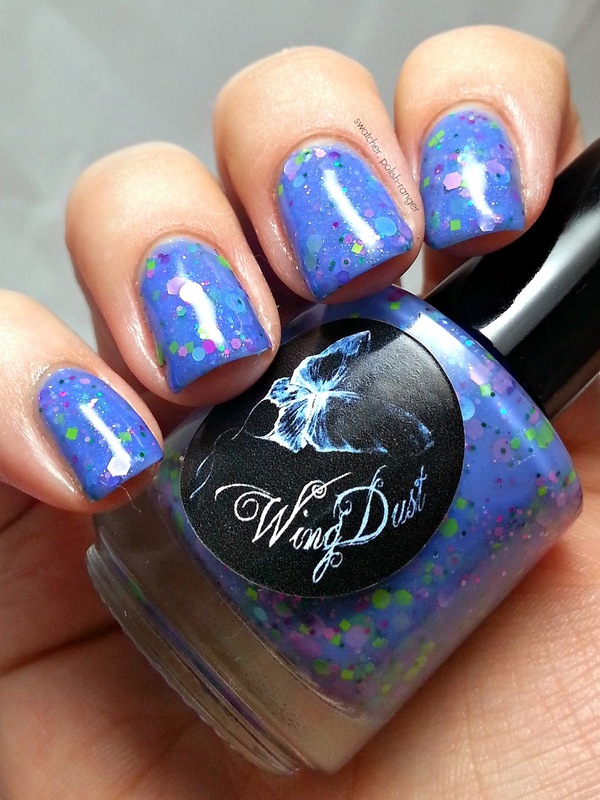 Welcome to another edition of WingDust Wednesday! How are you liking the feature so far? 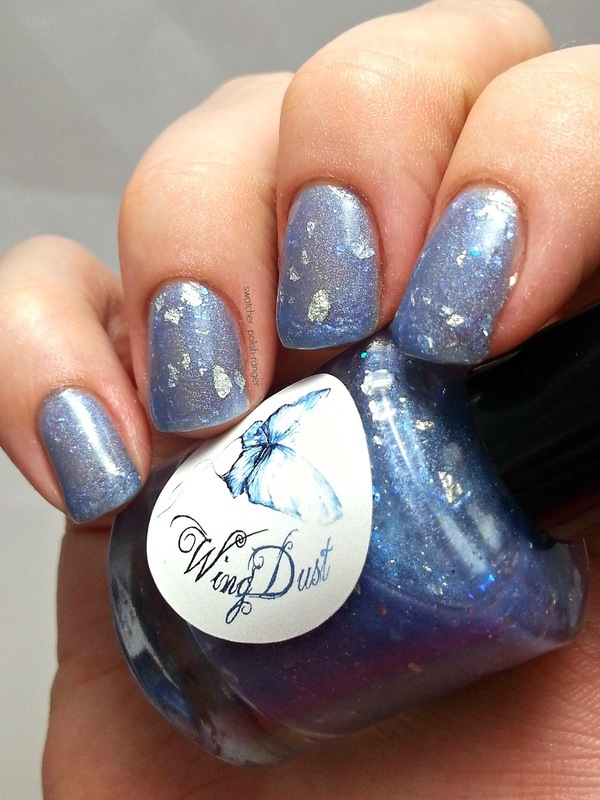 Has it inspired you to add some WingDust to your collection? 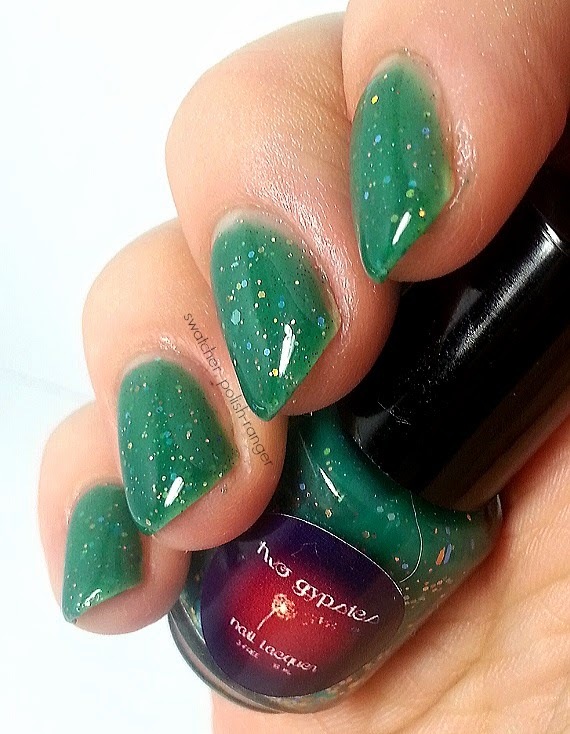 This polish is PACKED with glitter and requires a bit more patience to make sure that the glitter doesn't layer on top of itself. That said, I didn't have to fish for any of the larger glitter and it only required minimal dabbing. Shown here is two coats and one coat of Gelous to smooth things out. 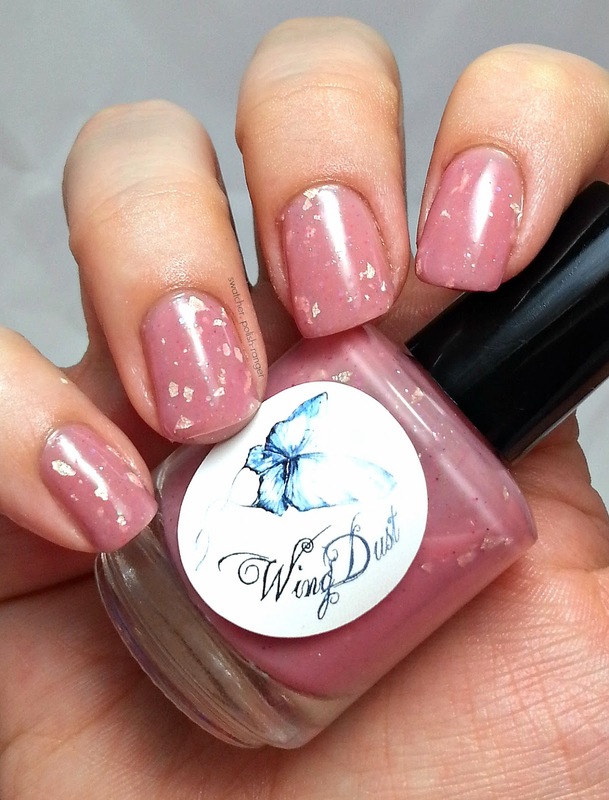 Show me your WingDust! 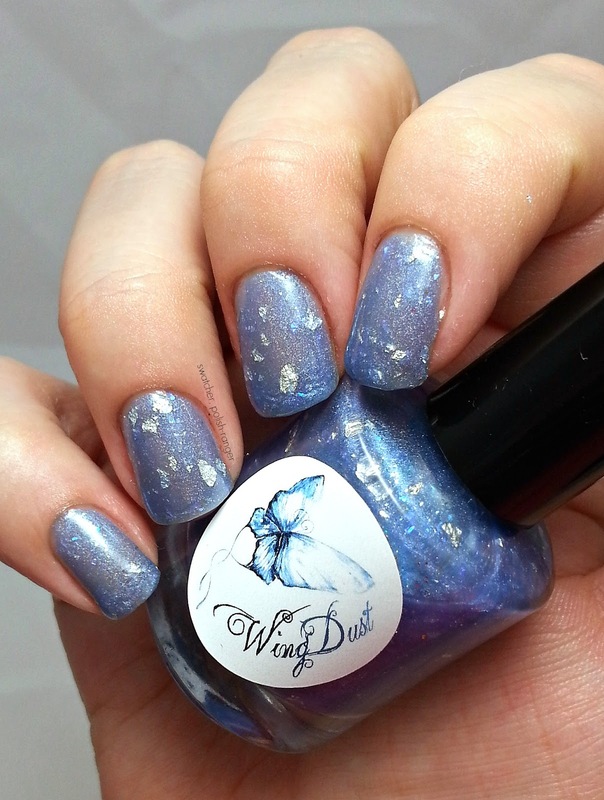 While currently out of stock in her shop, WingDust can also be found at Llarowe. All three of these were amazing and so pretty. Chilean Chocolate was on many a "best of 2013" list, despite being brand new, and I completely get it. 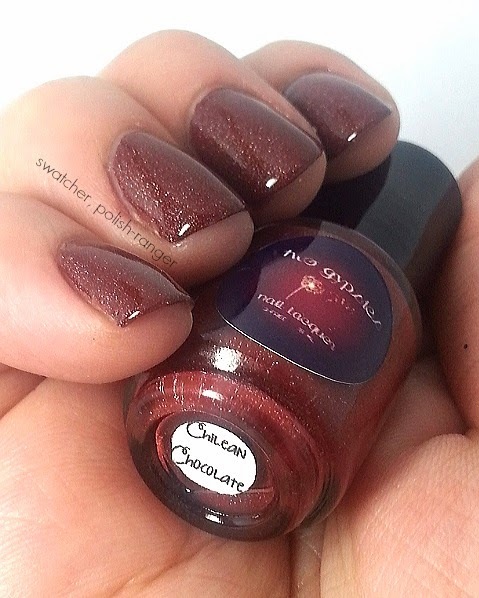 It's such a gorgeous red-toned brown and perfectly captures my favourite type of chocolate - that with a bit of heat. 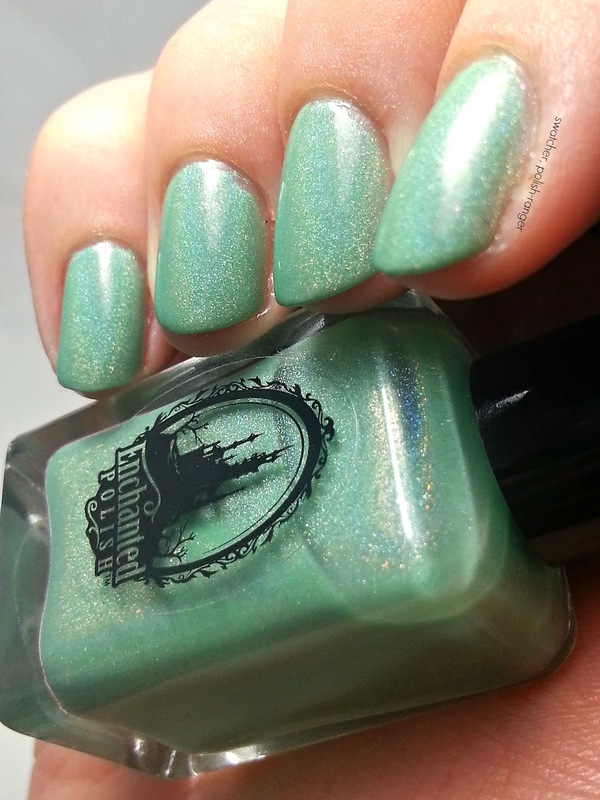 Spruce is a lovely light green holo and Lake Glass is pretty and delicate. I love me a good glitter bomb but the base to glitter ratio in this one is perfect and makes it a little more wearable. Two Gypsies is fast becoming one of my favourite brands. Their formulas are always consistent and I'm loving everything they are putting out. All swatches show three coats (for extra depth) and one coat of HK Girl top coat. 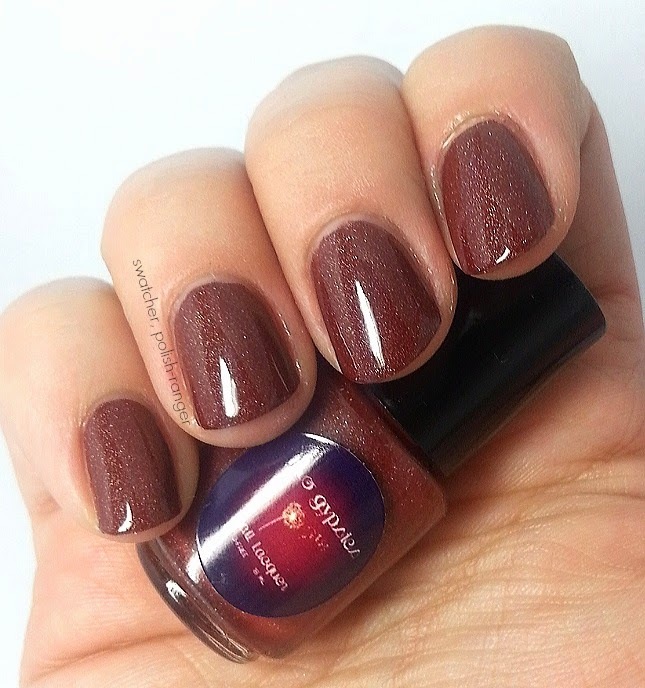 Chilean Chocolate is a red brown polish with a silver shimmer that features a subtle holographic sheen in the sunlight. As you might guess from the name, Chilean Chocolate was inspired by spicy chili chocolate! 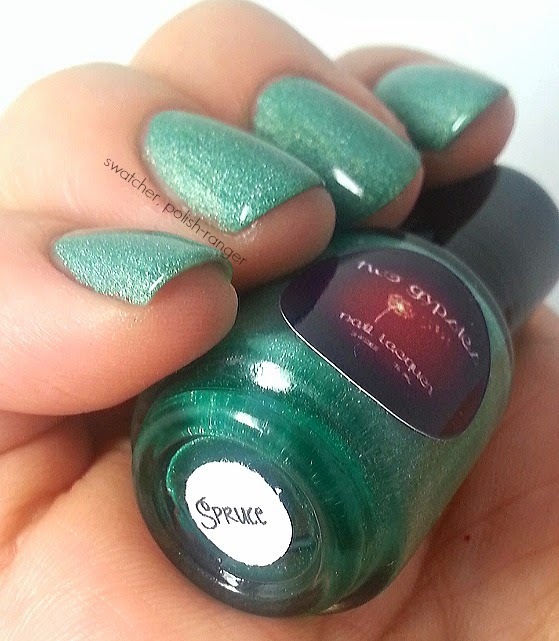 Spruce features a green base with tiny silver glitters with a holographic sheen in the sunlight. 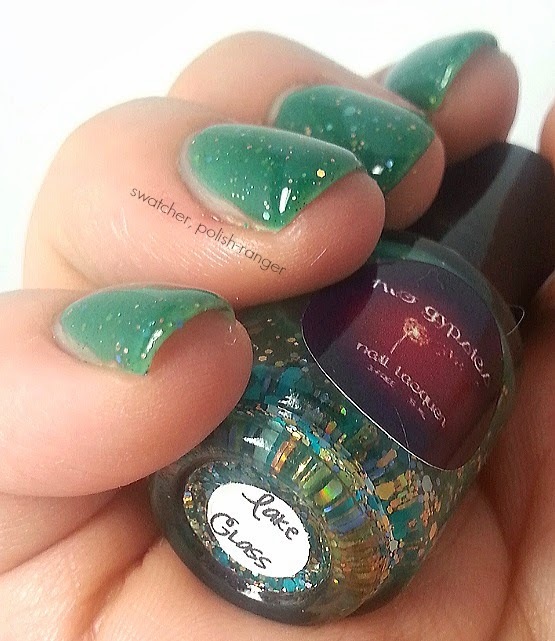 Lake Glass is a green jelly polish packed with gold, teal, blue, and copper glitter of various sizes. Lake Glass is inspired by the weathered sea glass we have enjoyed collecting from the shore of Lake Erie. Which one is your favourite? All three are currently in stock! I just received my order from the Spring 2014 collection so those will be up on the blog in the near future. So, I've been blogging, in one form or another, for a long time; at least since 2002 and the early days of Livejournal. And yet, 12 years later, my biggest weakness as a blogger is comparing myself to others. In previous iterations, my blogs followed trends and I tried to be something I'm not - a decor and lifestyle blogger. Sure, it's something I enjoy - who doesn't like pretty things? - but it was never something that I was PASSIONATE about. Nail polish on the other hand? 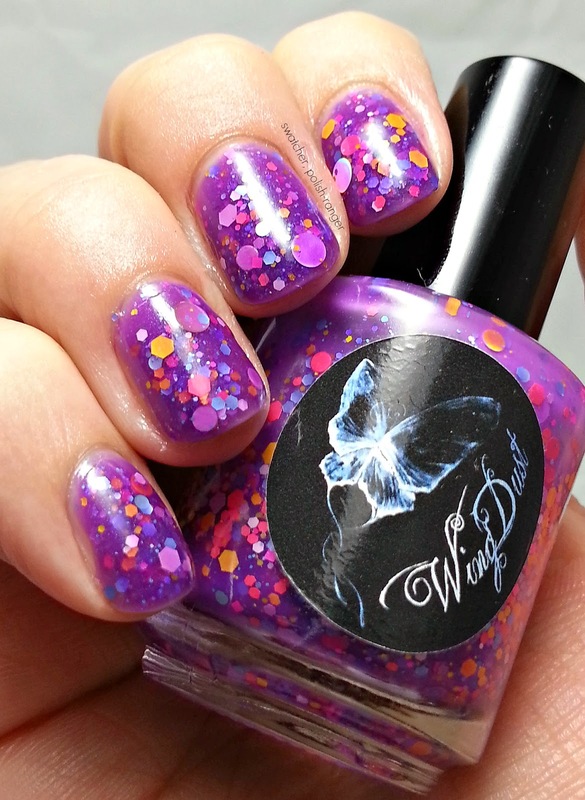 It may seem like a silly and frivolous pursuit to some but I truly see artistry in a gorgeous bottle of nail polish. I don't know if I'll ever call myself a writer or a photographer (definitely not the best at either) but, for the first time, I'm blogging because I love the subject matter and not because I'm trying to keep up with a certain niche. 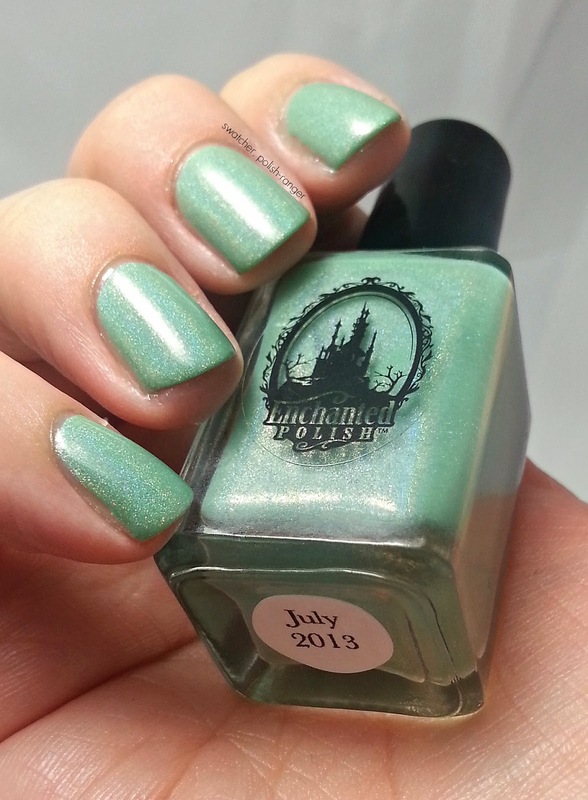 That said, I'm not super happy with my photos of today's polish. It's not the fault of the polish, I just think my application wasn't the best and it shows. 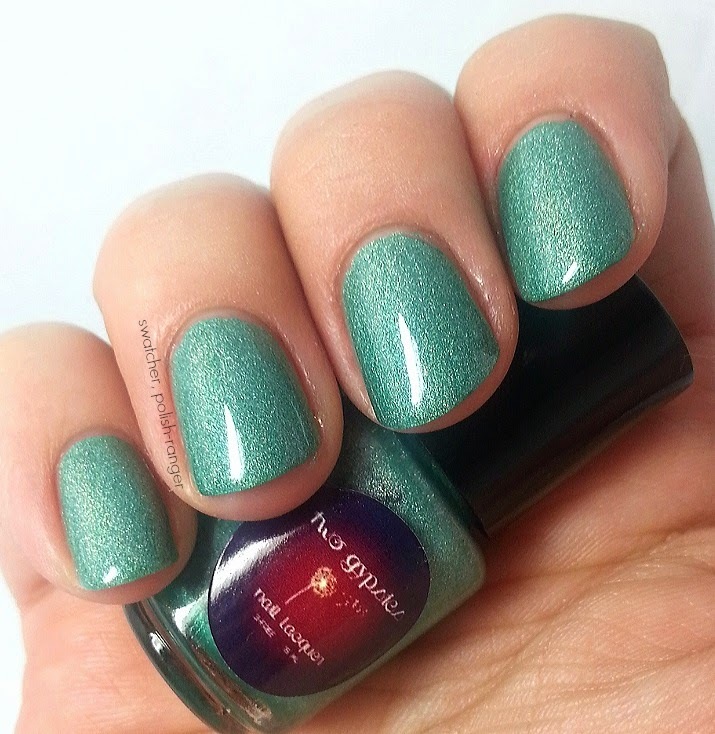 Want to see lovely swatch photos? 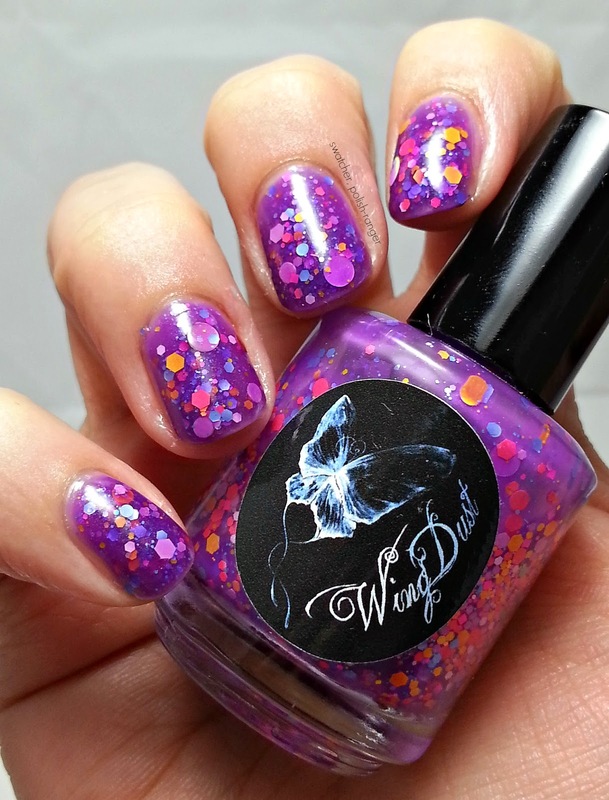 Check out Polished Pathology or Kitty Kam's Nails. On to the polish! 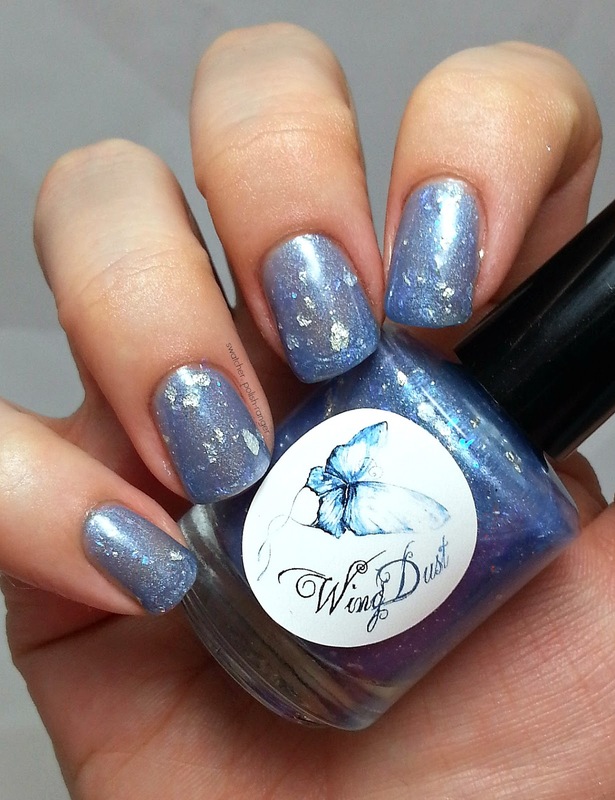 As described by Stephanie, These Broken Wings "has a soft blue/periwinkkle [sic]base that can look grey or lilac in different lights, linear holo, iridescent and silver flakes, 12 kt white gold leaf and a hint of aqua/lavender shimmer." 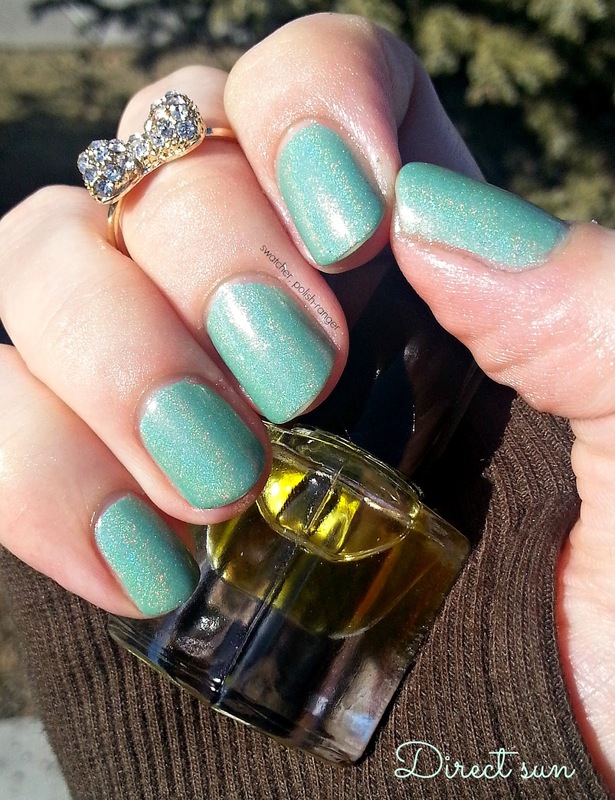 As with any polish that has gold leaf (like big sister, Steel Town Girl), you need to be careful with application. The flakes will come out of the bottle easily but you may need to dab a bit to ensure that the leaf lies flat on the nail. 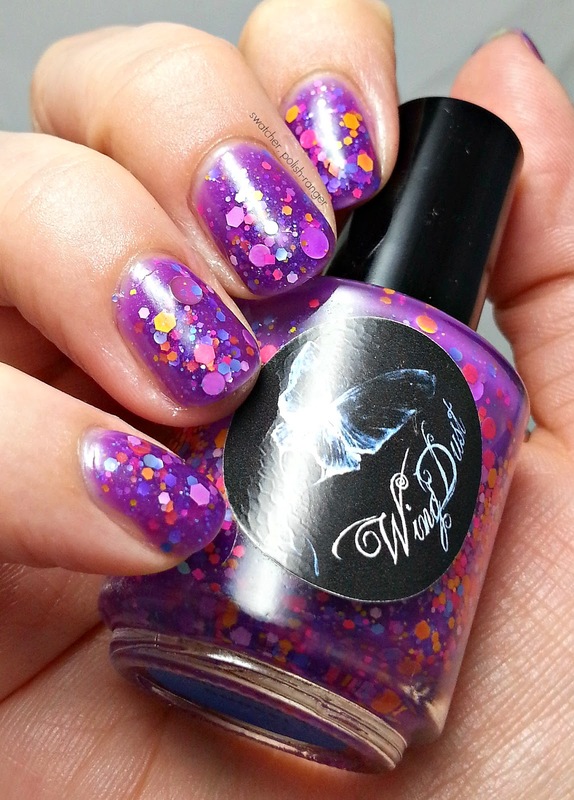 These Broken Wings is on the sheer side and shown here is three coats and one coat of Sally Hansen Insta-Dri. 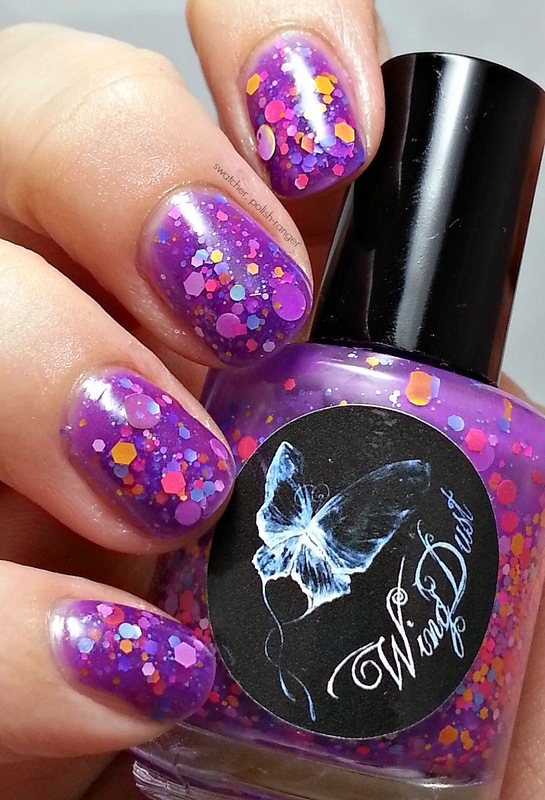 You may want to try layering it over a dark colour (like Polly Polish did) or a similar periwinkle creme. As with all of Stephanie's creations, this one is so unique and will forever have a spot in my collection. Today I am sharing a sneak peak from Stephanie's upcoming spring collection. If you fall in love (as you should) and HAVE TO HAVE IT NOW! you can currently find it in stock on Rainbow Connection UK. 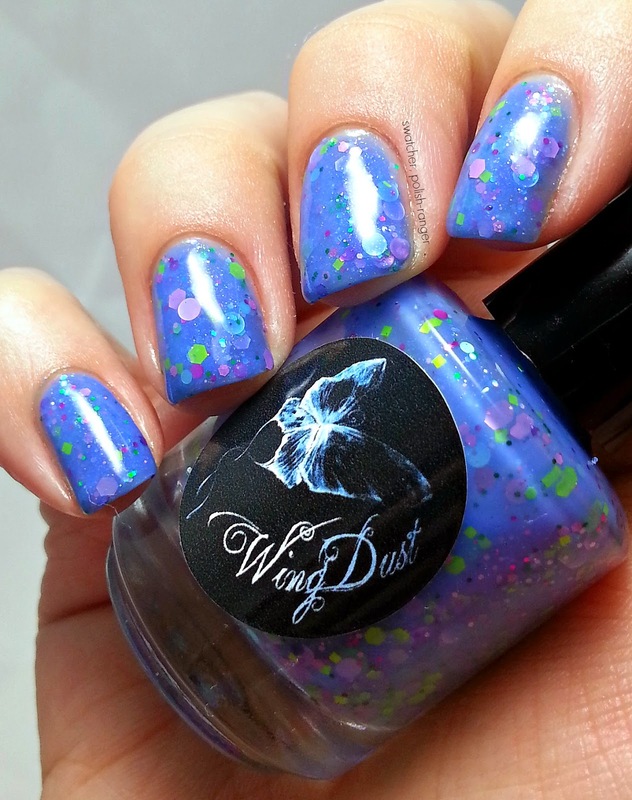 WingDust Collections Imagine Me N You has a periwinkle crelly base and is packed with large circle glitter, small circle glitter, hexes, squares and micro glitter in shades of purple, blue, pink & green. 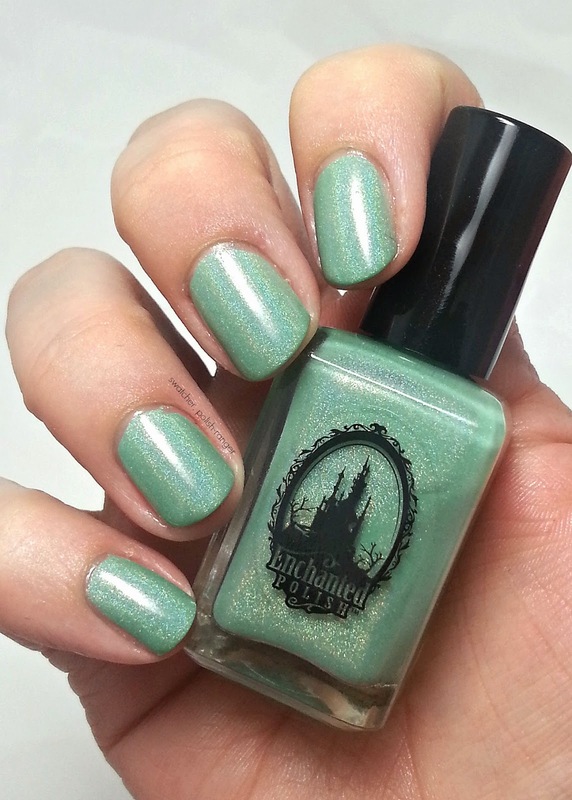 As with any polish that has so much awesome in one bottle, this one is on the thick side. However, Stephanie obviously works some polish magic because this was not at all difficult to work with and there is no fishing required! The colour combination is spot on for spring and I couldn't love it more! 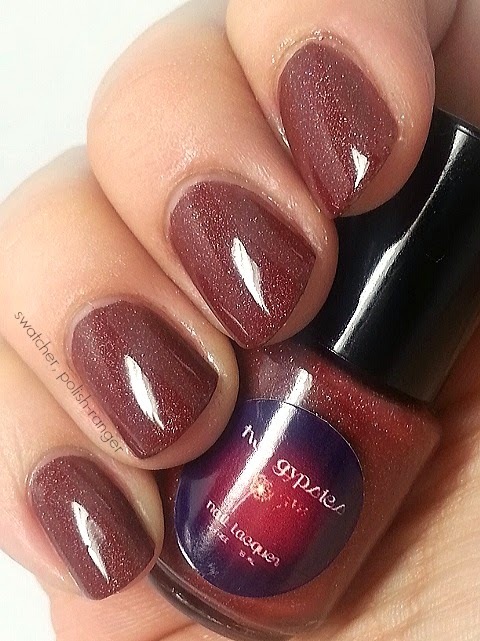 Shown here is two coats of Imagine Me N You and one coat of Gelous. 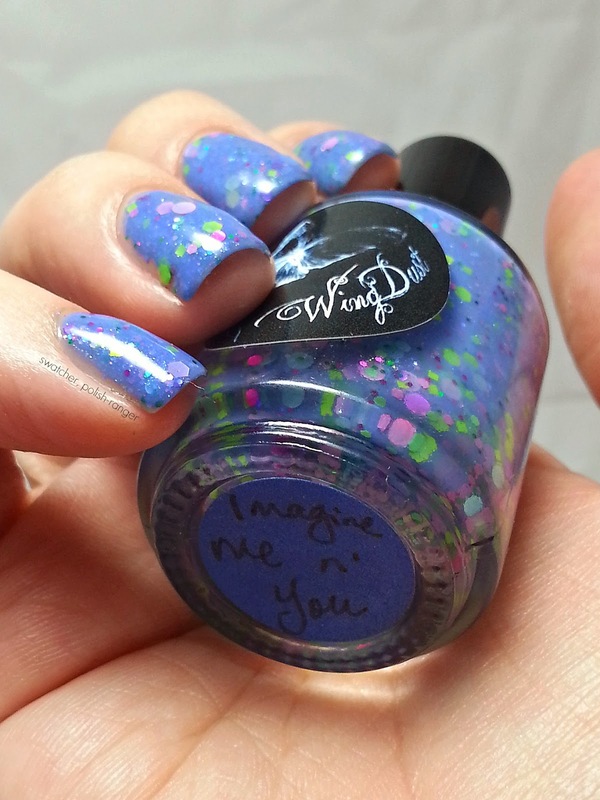 Want to see more gorgeous swatches of Imagine Me N You? 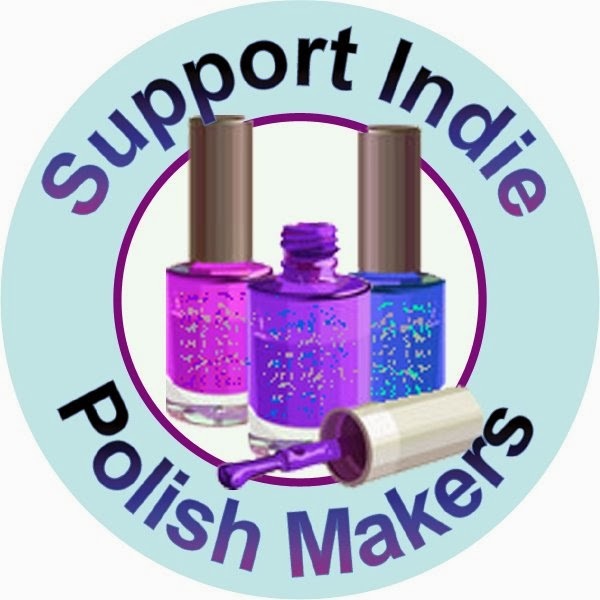 Check out Tia's post over at Iced Lacquer. We both, unintentionally, chose to feature the same polish today! Pssst... want to follow us on Instagram? I'm @swatcherpolishranger, Tia is @icedgreentia, and Kristina is @lacquershine. Today I have something a little different to share with you. Aside from nail polish, I am also obsessed with make-up and have recently fallen for highlighting my face. 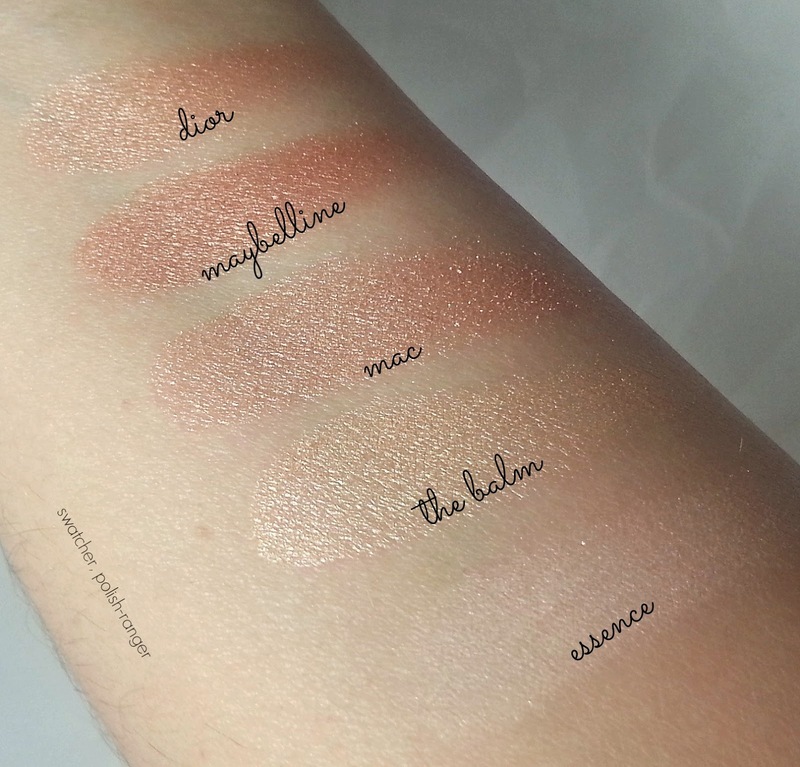 My the Balm order finally arrived from HauteLook so I decided to swatch the highlights I have - high-end and drugstore - to show you the differences and what I like about each one. Moving on to the Balm, which is the newest in my collection. Mary-Lou Manizer is a beauty blogger favourite and it's with good reason. The texture! I can't say enough good things. 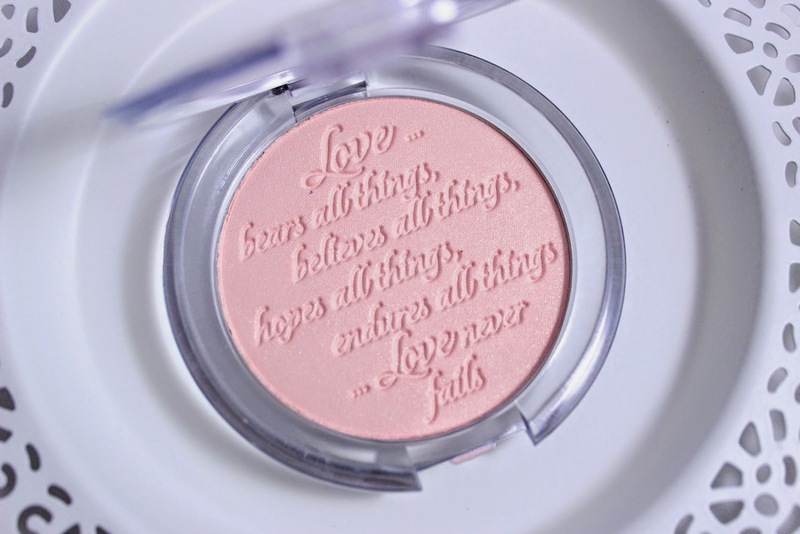 It's super soft and buttery and so pigmented. Just a light tap with your brush will likely give you more product than you need. 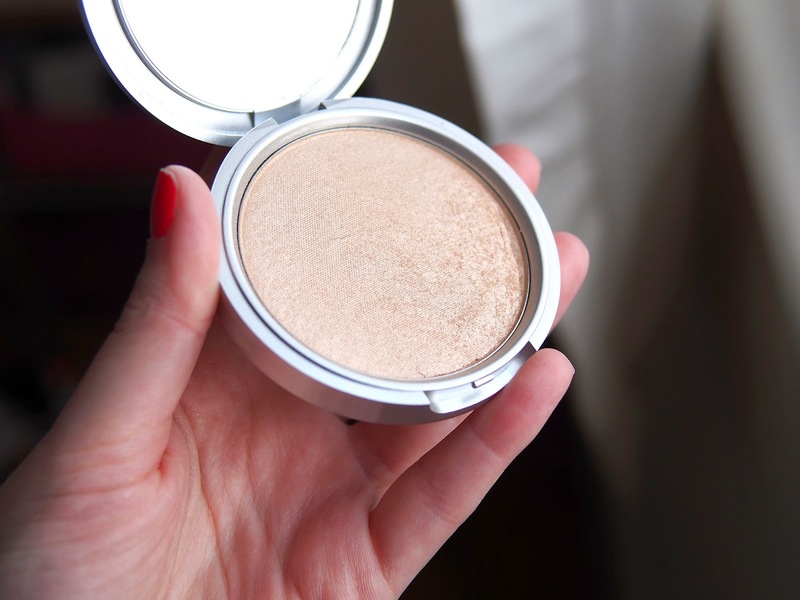 The light gold/champagne colour is gorgeous and it leaves a lovely shimmer on your cheekbones. It's love! 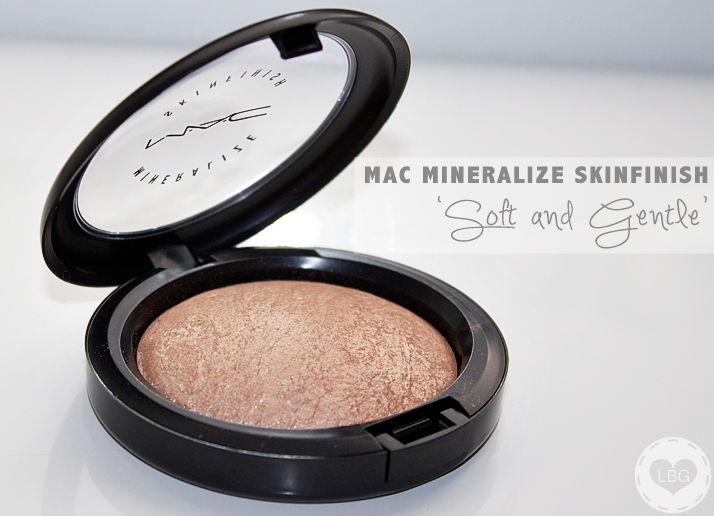 MAC Mineralize Skinfinish (MSF) in Soft & Gentle is another beauty blogger favourite. The MSF formula is highly pigmented and soft but not as buttery as the Balm, likely because it's baked and so a harder surface. 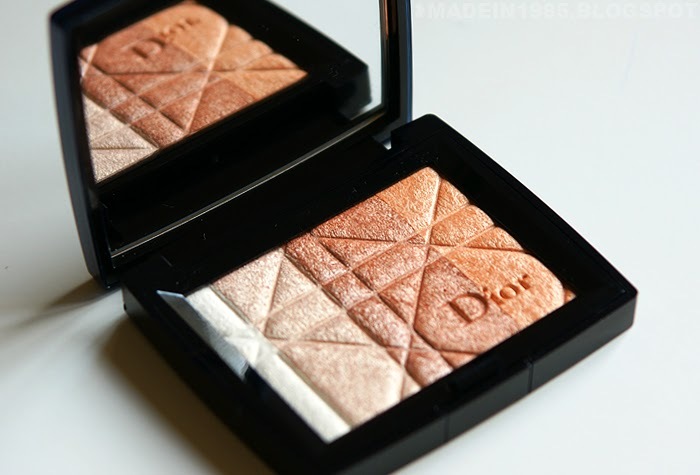 This one is a gorgeous champagne colour and I think it goes the best with my skin tone. I find this one has more sparkle than the Balm and it's a little more noticeable on my skin. Maybelline recently came out with their Face Studio line and, I gotta say, I'm impressed. 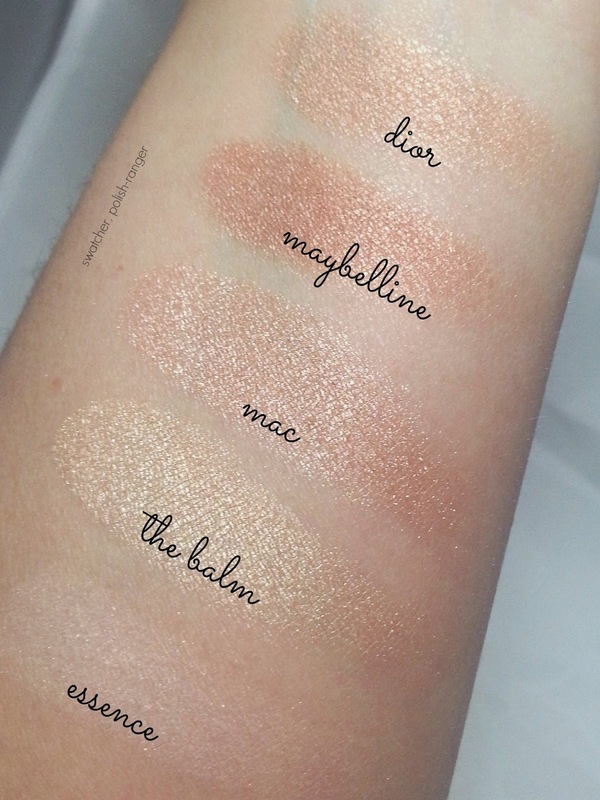 The prices are certainly on the high end for drugstore (I paid $16.99 at Shoppers Drug Mart) but I would easily say that the Master Hi-Light compares with the MAC MSF. I love the woven pattern and the ease of blending all of the colours. The texture on this was great and a swirl of the brush picks up the perfect amount of product. Finally, the most expensive member of collection, Dior Amber Diamond. Again, this is one that I picked up because of all of the hype and I'm really glad I did. I love the colour strip configuration which allows you to combine all five colours or just pick and choose for a lighter or darker look. I generally combine all five which gives a lovely light bronze highlight. 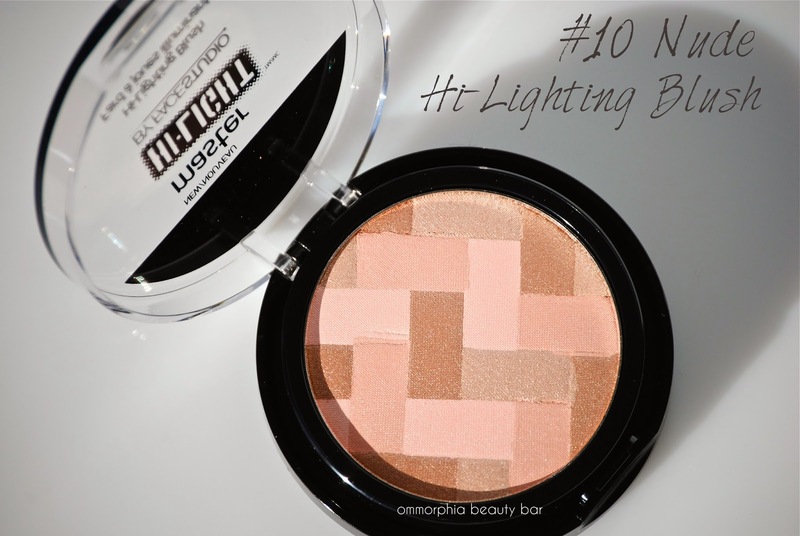 This one and the Maybelline one will be perfect for summer when my face gets a little darker. 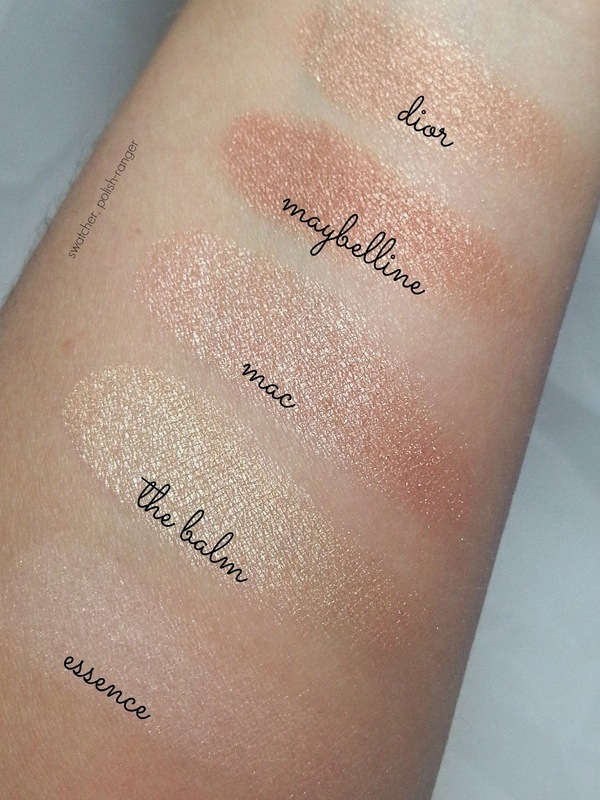 I swatched all five on the inside of my arm and took photos in slightly different lighting to show the shimmer and differences in colour. Which one is your favourite? Is there a highlight you think I should try? Every so often, if you are in the right place at the right time, you will meet someone who will change your life. Someone whose generosity never fails to impress. Who thinks about how they can make other people happy and then actually does something about it. For me, this moment was when I joined a nail polish sub on Reddit. There I met a group of ladies who have completely blown me away and who I feel very lucky to be able to call friends. 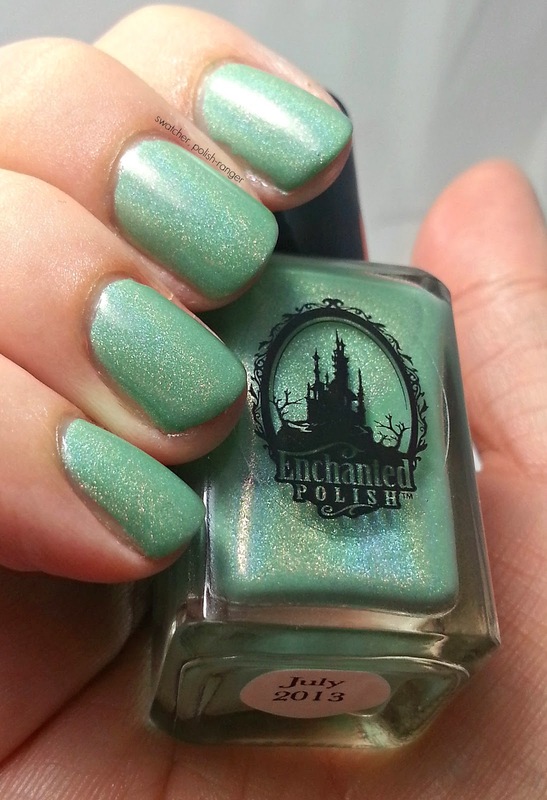 A while ago I was bemoaning the fact that I hadn't seen Enchanted Polish July 2013 on the resale market for less than $50. I know, right? Total wishful thinking. I asked my friends to keep an eye out for me and let me know if they came across one. Instead , my sweet friend Ashley organized a group, they all pitched in and the GOT JULY FOR ME! It arrived at my house completely out of the blue on Monday and I'm not going to lie, I cried. It's such an amazing feeling to be the recipient of such an unexpected act of kindness and I can only hope to repay it one day. Now, it's blogger confession time. I am a horrible, habitual cuticle picker. Normally when I'm swatching they aren't too bad because I apply cuticle oil every time I remove polish. But this week? Yeesh. They are bad and I apologize. 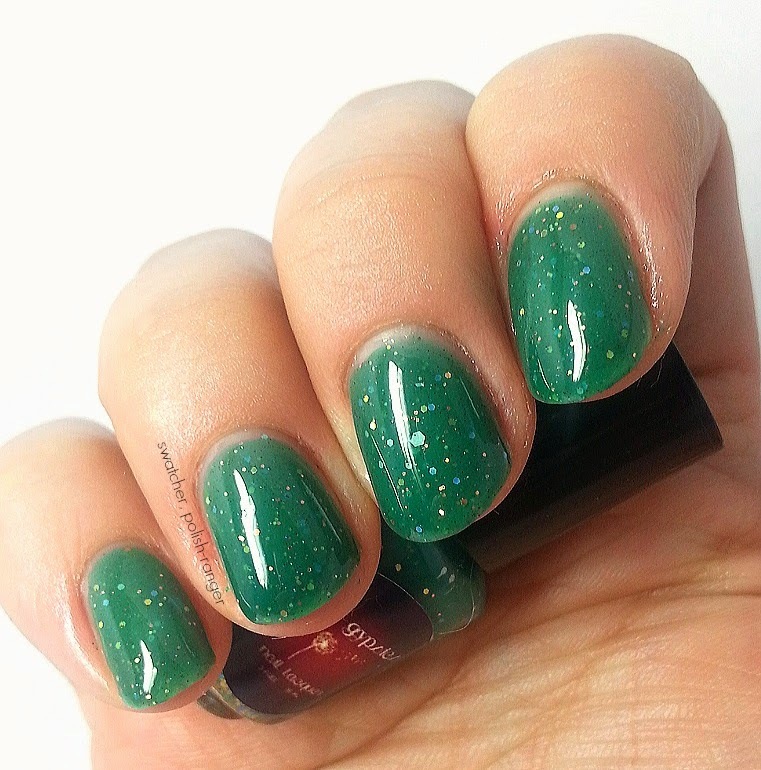 What tips do you have for cuticle care? 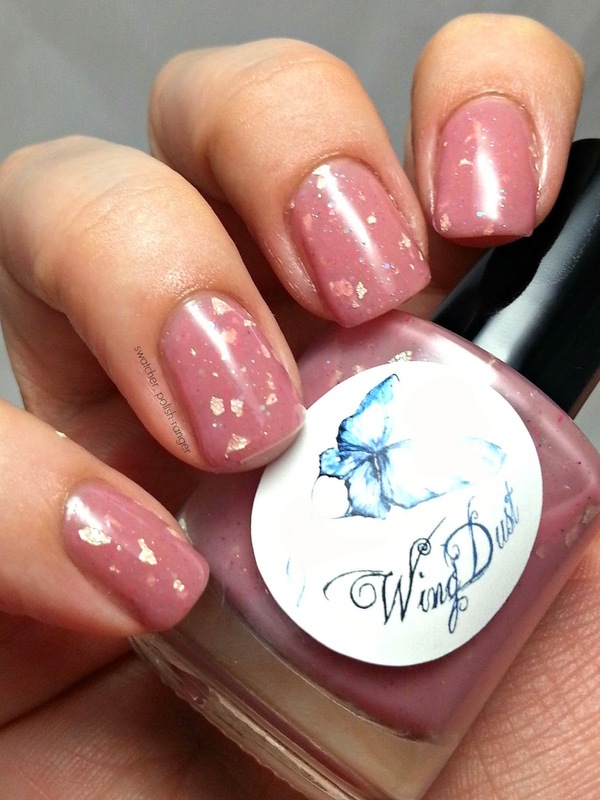 A while back, Stephanie, the creative genius behind WingDust Collections, had a pre-order for two of her most popular limited edition shades, Steel Town Girl and These Broken Wings. 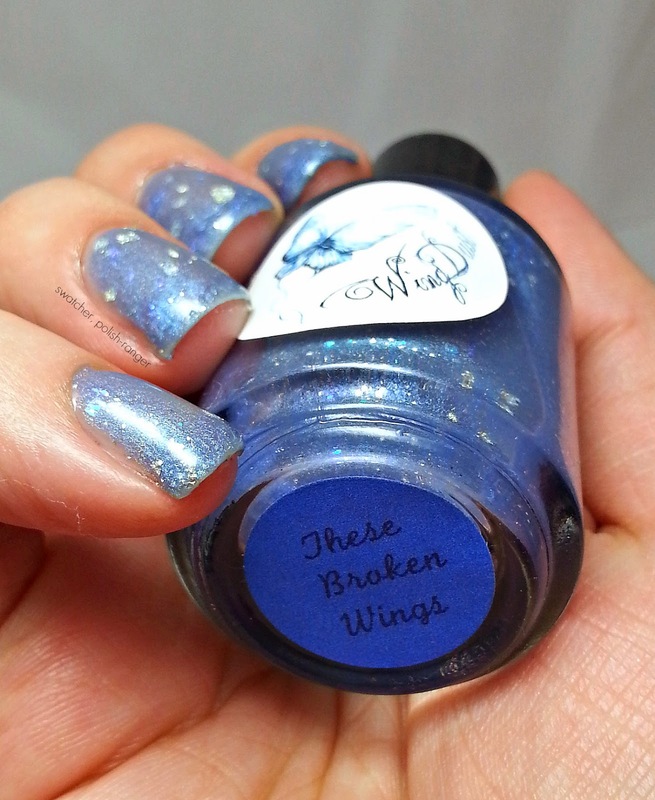 Since I was eager to get my hands on These Broken Wings (coming to the blog soon) and wanted to make shipping worthwhile (why, Canada Post, do you have to make shipping WITHIN Canada so expensive?! ), I grabbed several other colours I'd been eyeing for a while - one of those being Coral Leaf. I love all of Steph's creations but the ones that incorporate gold leaf are just so unique and special and I can't say no. Coral Leaf is such a soft and pretty colour while still being not your average pink. Any of the "leaf" polishes require a little bit of extra care during application to ensure that the gold leaf flakes lay flat on the nail but that patience is so worth it! Shown here is two careful coats of Coral Leaf and one coat of Sally Hansen Insta-Dri. 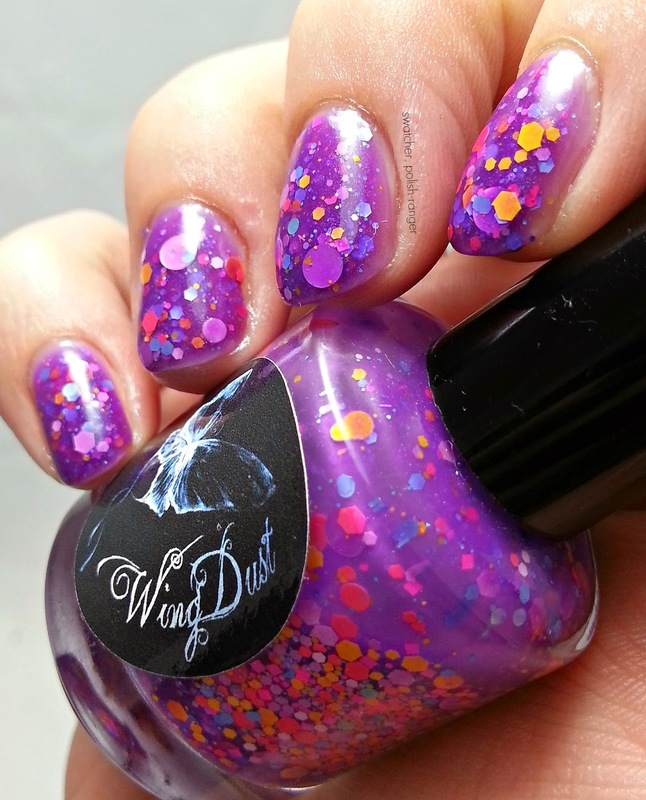 Pink- Coral creme, lots of shimmer, pink and purple micro glitters, 12 karat gold leaf flakes.